CONTRIBUTIONS TO As Perceived are most welcome. Please respect the editorial perspective and policy. AsPerceived is a quasi-co-operative enterprise. Contributors do not receive fees in advance but are paid according to sales of the e-book and print editions. Contributors retain ALL rights in their work but grant exclusive licences to AsPerceived. 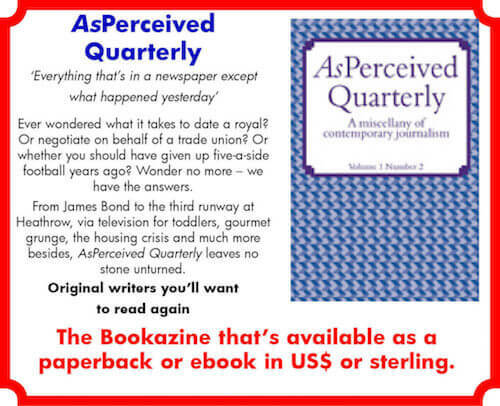 If you wish to contribute on this understanding, please initially contact the editor – editor@ asperceived.com including a telephone number, your time zone and an indication of convenient times to call as well as links to examples of you work. Contributions are particularly welcome from members of journalists’ unions, from those studying journalism on recognised degree courses or working on student publications. Should material published here be syndicated, AsPerceived will endeavour to negotiate the best possible terms for contributors and reach percentage agreements individually depending on the sums involved.